I thought this was just more blackberry, but the flowers are not pinkish, they're yellow. Any ideas? This is in Washington state along what used to be a logging road thru the woods. Some plants along here are native, some are not. I don't think the leaf is right for thimbleberry (Rubus parviflorus). The leaves of that plant are very large, about 4 to 8 inches in width, and are lobed like maple leaves. The flowers are white. I thought maybe salmonberry (Rubus spectabilis), but those flowers are deep pink to purple. The growth habit looks like it should be a berry of some sort, but I have no idea what it might be. We also have wild raspberries, but there again wrong flower. I did consult my pnw berry book, but found no match. I thought about raspberry too but, again, an all-yellow flower doesn't match. Perhaps it's some kind of weed. I'm a little confused with the photo. Does the plant with the yellow flower have spines, thorns The buttercup in my garden has no spines. Last edited by DoubleDogFarm on Fri Apr 23, 2010 4:37 pm, edited 1 time in total. I think a couple of my photos may be deceiving because of other plants in close proximity. I don't think there are any spines or thorns. Thanks for mentioning that. I'm learning to notice more detail. Not convinced on the buttercup identification. Can it be a species of Potentilla? 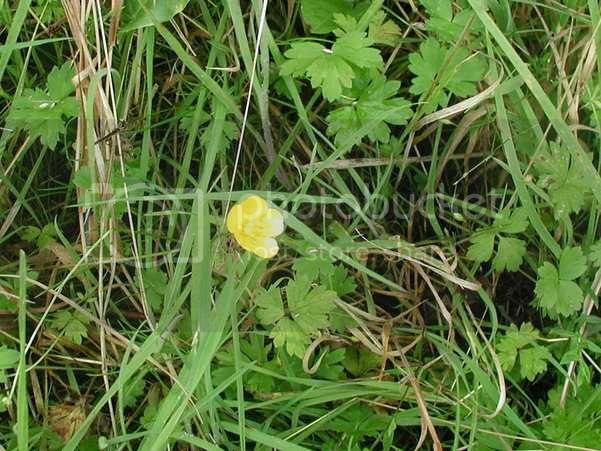 I don't see any leaves in your pic that look like creeping buttercup. I had to dig out a patch of that from alongside my porch last year. The stuff I removed from my yard looked exactly like the photo you linked to. I removed it because it's very invasive stuff. Here you can see how the leaves are made up of 3 leaflets, and each leaflet has 3 very distinct lobes. Yeah, maybe it's not Creeping Buttercup. It pretty much looks the same as your picture, Kisal. Do you have a name for that plant? My only thought is that on mine the leaves look very pointy. Geum Urbanum or Geum Macrophyllum has been suggested to me as well. The pic I posted is just another view of creeping buttercup. I included it because the triple leaflets and the lobes of each leaflet seemed to me to be clear to see. The buttercup I dug out by my porch grew in deep shade and had very dark green leaves, like the leaves in the link you posted. I looked at other pics of it, because I wanted to see if different growing conditions might produce leaves of a lighter shade of green, such as on the plant in the pic you took. I honestly don't know what the plant is that you took a pic of along the logging road. I'll keep searching, but right now, I have to go run some errands. I'm sure lots of other members are trying to come up with the ID, too. One of us will get it eventually! Yes. That was one of ones suggested to me (as I mentioned above). I think that's the best match so far, and the picture you posted, Kisal, seems right on. I think we can probably close the book on that one. Another yellow flower- Evening primrose, perhaps?